The second book in Martin Edwards's Lake District series is a variant on the classic "locked room" mystery, although events take place in the beauty of the north-west of England rather than in any dark cellars. As in THE COFFIN TRAIL, DCI Hannah Scarlett is leading a cold-case review team. The police receive an anonymous tip-off about an old murder, that of local landscape gardener Warren Howe. Howe was by all accounts an unpleasant man who was nevertheless unaccountably "successful" with women, and the anonymous letter identifies his widow Tina as his killer. Tina is now running the business together with Howe's partner Peter Flint, with whom she is having a relationship. Much of their current life is seen through the eyes of Tina and Howe's two children, now teenagers: the unpleasant and threatening Kevin; and the emotionally unstable Kirsty, whose only real love is sky diving. Much of the book consists of Hannah, Nick and her team going over the old case, interviewing all the people who knew or associated with Howe. We see what has happened to Howe's old lovers in the interim, as well as his employers at the time of his death, Roz and Chris Gleave. Chris, then a budding musician, vanished over the few days of the murder and was found in London: what was he doing there? Hannah senses that her colleague Nick, who was part of the original investigation team, knows more than he is letting on, but it is quite a surprise when she eventually finds out the real reason for Chris's actions. Daniel Kind, the Oxford academic who has given up his career to downsize to the Lake District with his partner Miranda, returns in this sequel, as the owner of the titular garden. He cannot understand the layout of his garden or why such strange plants are growing there, so consults Peter Flint. 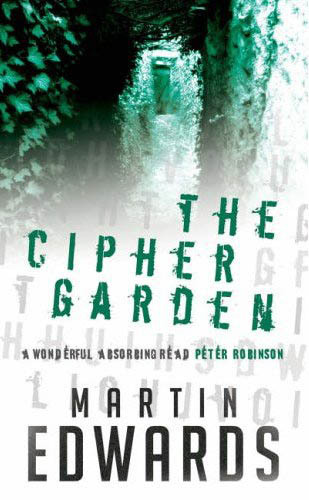 By this route, Daniel becomes involved in the case of Warren Howe, and not only solves the historical mystery of THE CIPHER GARDEN, but comes to be involved in the modern crime investigation and its several surprising secrets. Martin Edwards has cleverly written a claustrophobic mystery, involving a small set of suspects: he doesn't cheat the reader, he doesn't have to use a locked room, and the solution is a clever one that I didn't guess in advance. The pace is slow in the main body of the book, yet hots up excitingly to provide a satisfying and even moving conclusion. The romantic tension between Daniel and Hannah is still mainly hinted at rather than explicit, but Miranda is clearly uncommitted to her chosen new life in the Lake District, and it would not surprise me if the writing is on the wall both for her relationship with Daniel and for Hannah's relationship with her unfeeling partner Mark, whom I liked even less in this book than I did in the last. Read more reviews of THE CIPHER GARDEN, here and here.